Piedmont’s diverse geography and cultural heritage is reflected in its wonderfully varied cuisine and wines. This ‘cook & explore’ tour will take us from the cafés of Turin to the hilly vineyards of Barolo and the mountain hamlets of the Western Alps. It includes cooking classes with leading-edge chefs in the Valle Susa, Langhe and Saluzzo, as well as visits to sites of historical-artistic significance and wine tastings at premier local vintners. Turin has long been a cultural and culinary capital of Italy, even before hosting the 2006 Winter Olympics. Its rich artistic heritage often comes as a surprise to visitors expecting something less from Italy’s industrial center, better known for the automobiles it manufactures than for its culinary masterpieces. Turin is, however, widely regarded as one of the best places to eat in Italy. Local cuisine features a combination of French and Italian influences in unique antipasti, primi piatti and desserts, all perfectly accompanied by extraordinary regional wines. Turin is also famous for its chocolate production: indeed, our tour will begin in a most deliciously civilized manner, over a scrumptious hot chocolate at a classic café in the city center. Energized, we’ll then walk through the heart of the city, with its splendid baroque architecture, and take a guided tour of the magnificent Royal Palace of the Savoy family. After lunch, we’ll head to a well-known chocolate factory for a tour of their production facilities and, naturally, a tasting, and finish the day with a visit to architect Filippo Juvarra’s masterpiece, Superga Basilica. The basilica overlooks the entire city, and if we are lucky enough to be there on a clear day, we’ll be able to see the great curve of the Western Alps, and the snow-covered peaks surrounding us on three sides. Straight across to the west, we’ll be able to spot the entrance to the Valle Susa, our destination the following morning. Today, our journey will take us along one of the most important routes through the Western Alps, the Valle Susa, traversed by armies, traders and pilgrims since time immemorial. Our destination will be the fortified town of Avigliana, where we’ll arrive in time for lunch at the restaurant of our first chef-mentor of the trip. Like all chefs we visit during this excursion, he is dedicated to using only the best ingredients – in particular he has been enthusiastically reproposing the use of ancient ingredients and old recipes, some in danger of fading into extinction. After lunch we’ll stroll through town to get acquainted with our home base for the next two days, and then settle in at our hotel, situated on one of the beautiful lakes nearby. Our day will begin with a bit of shopping, as we pick up some of our supplies at the local markets. Then, we’ll be off to the restaurant to begin the lesson, during which we’ll prepare the dishes we’ll have for lunch. Our meal will feature such traditional local specialties as risotto made with Valle Susa blue cheese, Valle Susa polenta cake, and other dishes made even more unique thanks to our chef-mentor’s personal touch. After lunch, we’ll walk up to the Sacra di San Michele, a spectacular monastery-fortress that overlooks the entire valley. Then we’ll return to our mentor’s restaurant for our next cooking session, this time to help him prepare for dinner, when we will once again consume with gusto the fruits of our labor. We’ll head toward the Langhe this morning, into the Barolo wine country that will be our home for the next three nights. We’ll be introduced to Barolo wines by a lively winemaker and his family, during lunch at their vineyards in Serralunga d’Alba. After our meal, we’ll check in at our lovely agriturismo (working farm/inn), nestled between the castled hilltowns of Serralunga and Castiglione Falletto, and meet our second, quite innovative chef-mentor. We’ll then take a walk through the vineyards towards Castiglione Falletto, enjoying the scenery and working up an appetite for our first experience of our chef mentor’s culinary art. Depending on when we began the tour, we’ll accompany our chef-mentor to the local market, or we’ll venture out into the fields to pick fresh herbs, under the tutelage of some of the young agriturismo staff. Then we’ll begin preparing our lunch, which might feature fresh agnolotti (traditional meat-filled ravioli) and finish with a very tasty Barolo sorbet. This afternoon and evening we’ll explore the nearby town of Alba or walk to another hilltown in Barbaresco country. We have a very tough day ahead of us! We start with a hazelnut chocolate tasting in Cherasco, home to one of region’s oldest and best-known chocolate producers. After visiting some of the town’s historical monuments and stopping for lunch at a local trattoria, we’ll head back into Barolo country and the hill town of La Morra, for a wine tasting at a renowned vintner. Equipped with our recently acquired knowledge of chocolate, we will be able to critically assess the pairing potential for each chocolate and wine type. This evening we’ll enjoy dinner at another restaurant or working farm near where we are staying. Leaving the Langhe behind, we travel westward towards the wall of the Alps that forms Italy’s border with France, into the region of the former Marquisate of Saluzzo. We’ll tour the marquis’s former residence – with its spectacular frescoed chambers – before heading into the hills for a cheese tasting at a local farm. Then we’ll drive to our residence for the next two nights, a lovely bed & breakfast in the hills above Saluzzo. This is one of the few ‘green’ B&Bs in Italy, whose architect/artist owners have painstakingly provided their home with solar panels. In the afternoon, we’ll stroll through the chestnut woods surrounding the B&B to two nearly abandoned borgate (mountain hamlets), with spectacular views of the plains below and the slopes of Monviso peak above us. The day will end with a typical dinner at a mountain trattoria. This morning we’ll have the opportunity to cook with a premier local chef who specializes not only in Piedmont cuisine but is also celebrated for his seafood dishes. After an elegant lunch on our creations (which could range from traditional gnocchi al castelmagno and filetto di fassone al Barolo to variously prepared scallops, clams or sea bass dishes), we'll meander through the town of Saluzzo, shopping for our dinner this evening. We’ll have a kitchen at our disposal at the B&B, so if we wish, we can test our newly-acquired cooking prowess tonight, making a Bagna caôda (‘hot bath’ vegetable dip) or other typical party dishes. We might even sit back after our meal, sip on a glass of Barolo and tell stories, true or otherwise, as did the people of this region until not so long ago. Depart from Milan’s Malpensa Airport. Group minimum 6, maximum 10; includes 1 full day and 2 half days of cooking with professional chefs, all meals with the chefs, dinners, cultural visits and wine and cheese tastings, as well as all accommodations (3-star lakeside hotel near Avigliana, lovely farmhouse inn in the Langhe and bio-green B&B above Saluzzo), transportation, guide and driver costs. Itinerary the same as Days 1-3. Itinerary the same as Days 4-9. The tour is recommended from April-June and September-November, the fall renown for porcini mushrooms and truffles, in addition to the grape harvest. 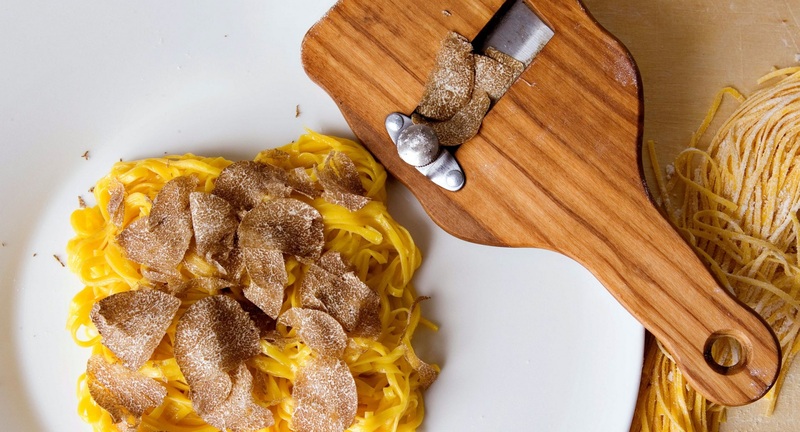 The full excursion includes 1 full day and 2 half days of cooking with professional chefs, while the shorter Turin - Valle Susa tour includes 1 full day and Langhe – Saluzzo includes 2 half days of cooking. All versions include all meals with the chefs, dinners, cultural visits and wine and cheese tastings, as well as all accommodations, transportation and accompanying guide/driver costs. Please note that cooking sessions with the above-described chefs are subject to the chef’s availability. Single, 2-3 day Valle Susa, Langhe or Saluzzo excursions can also be arranged upon request. Cooking experiences in the Piedmont could also be combined with cooking and/or walking adventures along the Mediterranean coast in nearby Liguria, home of pesto, branzino, taggiasca olive oil, wonderful herbs, beautiful flowers and charming hillside villages. Pre- or post-tour possibilities could also include touring the Monferrato region, Lake Orta or Lake Como. Please let us know how we can best arrange your stay.